Back in Post 28, I pointed out that my Pendraken Hungarian line infantry standard bearer’s flagstaff was missing the tip of its spear-shaped finial. 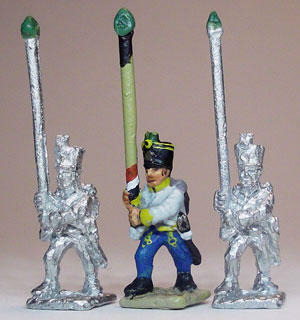 As it turned out, the tips of all the spearheads of my Hungarian line infantry flagstaffs were missing. I used green stuff to do a bit of repointing. With my self- confessed preference for variety when it comes to figure poses, I decided that time would be well spent trying to add a bit of variety especially to officers and artillery crews. So, I had a not- too-complicated go at chopping off some arms and modelling replacements. 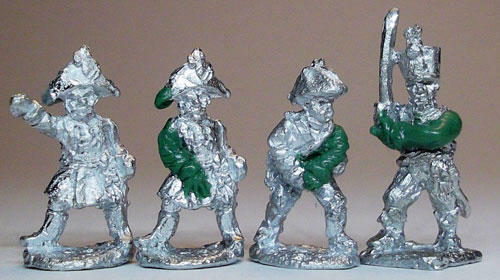 I wanted a bit more variety in the ol’ mule train so I got some castings of the mule from the Pendraken fantasy range. I added a bit more pack to the back of one and I also experimented with repositioning the head of Pendraken’s other – non-fantasy – pack mule (see Post 35). Two Austrian artillery officers and a crew member with reshaped or remodelled arms. The Hungarian officer on the right is now pointing the way.